I was overweight nearly my entire life….from the age of 3. My doctor would tell my mom every year that I needed to lose weight and I just kept getting heavier regardless of the fact that I was not a big eater and I was just as active as any other kid my age. My weight didn’t keep me from what I loved which was (is) music and theater! I loved being in the spotlight and enjoyed performing regardless of my body, however when I hit college and was a performance major…that’s when it hit. Trying to perform professionally never happened because of my weight. I didn’t have a boyfriend until college (I started college at 174….I found out I was lactose intolerant and also gave up soda and stared exercising so I lost weight before college in 2000) and then ended up in a bad marriage because I was so overweight that I settled thinking I wasn’t good enough for anyone better. In 2011 I hit rock bottom. I ht my heaviest weight (that I know of) 261! I would watch The Biggest Loser and just binge and cry! I was depressed and seriously considering weight loss surgery! I went to the adult version of Camp Shane! It helped me discover the root cause of my binge eating disorder which started in college and I found new exercises that I really enjoyed. That was a new staring point for me. Being away also helped me realize I deserved more and finally got divorced in 2013! The start of my weight loss came from exercise and better portions making sure my meals were well balanced. RELATED: 162.5 Pounds Lost: Doing it for ME...162.5 Pounds Lost! I saw result in the first month away at the resort. I lost 15lbs in that first month! I have always had a lot of medical issues and pain issues. Chronic migraines, inflammation, anxiety, and zero support from my ex didn’t help in the first year either. It was hard having everyone around me eating however and whatever they wanted while I was doing my best to really change my lifestyle. I also had a major surgery only 6 months after beginning my journey. I was out of commission for 8 weeks, but stayed the course and still lost weight. Then getting very ill later that year and going into 2013, moving back in with my parents and starting a new life (staring with no job) were all challenges that I manage to push through! I’ve definitely realized my strength over the two years it took me to lose the weight! The constant weight loss and changes kept me motivated all the time. Sure there were days that I was tired, sick etc but I never stopped! More so recently I’ve felt like “giving up” more. I never would, but life these days is a lot more stressful and weight loss has been much harder. I just have to find my new groove! While I was losing I did not hit any plateaus! It was amazing! Since then however, I have gained 20lbs back between my body composition changing and just life, stress, another major surgery and trying to have a baby for the last 2+ years. I’m back at it strong now and know I’ll hit my goals! 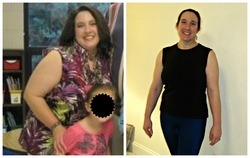 RELATED: 113 Pounds Lost: Change your inner monologue! So many! Having my goal clothes from college be too big was pretty fun! 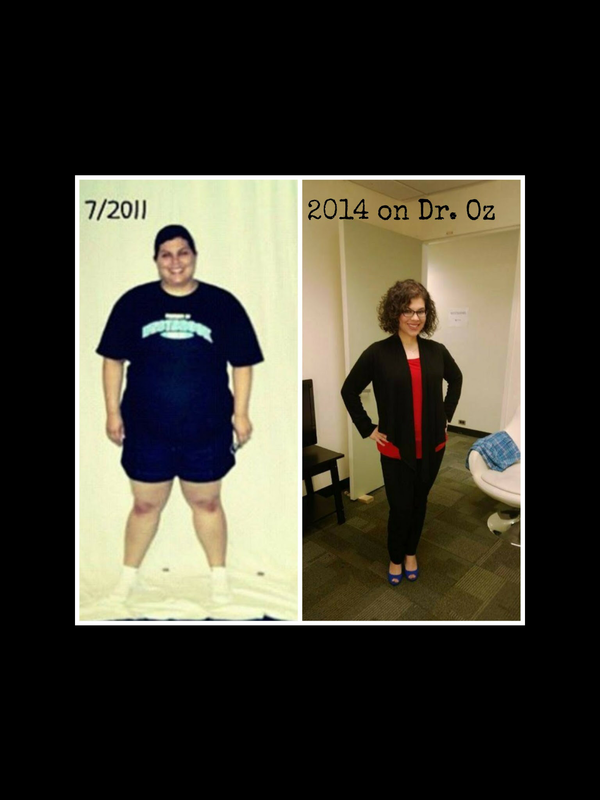 Fitting into one leg of the shorts I wore at my heaviest on The Dr. Oz Show was the ultimate! Just being asked to be on the show for my weight loss success was incredible! When I was heavy I pretty much tried to eat “healthy” and balanced. My portions were definitely off a bit and I always felt awful! I also had a closet emotional binge eating disorder and would eat anywhere from 500-700 calories in a 10-20 minute period. It was so numbing! The cycle was awful….a feeling of euphoria for those 10-20 minutes, then guilt, disgust, self hate and so on. Then I would crave more and the cycle would begin again! When I was heavier and yo-yo dieting, I only ever did cardio! Even at the start of my weight loss journey I was still not doing cardio with some yoga. After recovering from adrenal fatigue and hitting a huge weight loss milestone, I met with a trainer and worked with him for 6 months in 2014! He introduced me to high intensity interval training and I was hooked! This is totally not quirky at all, but Tons of water! !